YAY!!! It’s time for my annual Birthday Sale!!! Please join me in celebrating with the coupon code BIRTHDAY35 thru 8/8/18 at midnight EST! You will save 25% off of all of my self published patterns! Shop HERE or HERE!! To make this birthday even more special - all of my patterns from my book, A Sense of Place, are now available for individual purchase!! (They also happen to be perfect for gift knitting with most of them sized for the entire family!) You can find them all in my DRK shop or on Ravelry!! The day is finally here!! 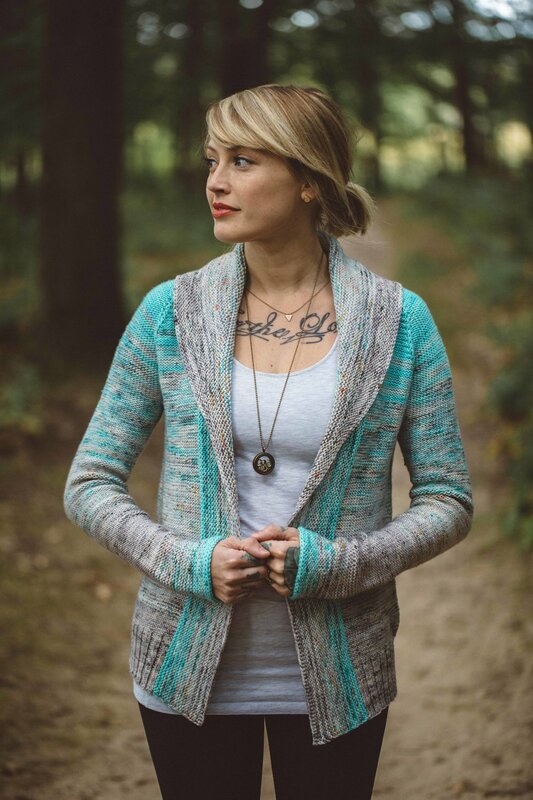 I shared a sneak peek of this pretty new shawl over a month ago in my weekly DRK Newsletter! I am so excited to finally release The Golden Hour Shawl so that you can all knit your own! This is the shawl of my dreams - loads of texture (hello BOBBLES! ), fun color play that is easy enough for a newbie, and it knits up super quick thanks to worsted weight yarn!! I had so much fun with this one that I knit a second one in less than a week!! Full disclosure - y'all, naming patterns can be HARD! LOL! Sometimes the name will come to me as soon as the idea of the design does, but if not - wowza. It can end up being the hardest part! So I've gone through about a dozen different names for this shawl, and just kept changing my mind. But as my husband and I raced out for the photo shoot last night, at that breathtaking hour of glowy summer sunlight - it all fell into place. You see, we pretty much ONLY do photo shoots on over cast days. Any of my fellow photographers will probably agree that when it is overcast - magic happens! The photos look beautiful, and the stitch definition - woah mama! Sunny days on the other hand can be very tough. Things get washed out, funky shadows show up everywhere and it's hard to show the true colors of the yarn. The good news? We live in Michigan! So if you wait a day or two, you'll get the necessary gloom for the perfect photos. Until now. We waited for over a week, and day after day was bold sun with ne'er a cloud to be seen. We finally came to the last day we could take photos and we knew we just had to go for it, and hopefully learn how to take some bright light pictures that we love! Well, thanks to that magical hour before the sun dips below the horizon, my husband was able to capture some pictures that we think are pretty special. It was also the best reminder that we should always push ourselves to learn new things, even when we feel doubtful or scared! Maybe this pattern will give you that same opportunity for learning! Are you new to bobbles? Check out my video here for how to do them without needing to turn your work! May the garter tab cast on has felt intimidating?? I've got a video to help you through that one, too! No matter where you are in your crafting journey - I hope it is filled with joy and learning! You can snag your copy of The Golden Hour Shawl HERE or HERE !! P.S. Save 10% on The Golden Hour Shawl with coupon code GOLDENHOUR through 7/11/18 at midnight EST! I'd also like to give a big congratulations to Kaitlin, the winner of the Woolberry giveaway!! Thank you to everyone who left comments - they were so much fun to read! Happy summer knitting! I am SO excited to finally share these sweet little socks I have been knitting on - Tuku Honey! I've really been trying to look at my wardrobe when getting inspiration for new designs, so I can see what I could really use. Well, when I opened my sock drawer that became glaringly obvious! I only have a couple pairs of hand knit socks, all of which have seen better days and one of which shrunk after an accidental trip through the dryer. Last year, my friend Shannon introduced to me to Blundstones - HELLO new favorite boots! They dress up or down and are my absolute go to, and I knew they would be even better with a pair of hand knit socks peeking out the top. It was time to get knitting to bulk up that sad little sock collection! I had recently acquired some Tuku Wool in two of my favorite colors (mustard yellow and dusty grey pink). I decided to begin with my favorite Turkish cast on, so I could knit them from the toe up. I am a huge sucker for texture, but wanted the pattern to be one I could memorize for when I was traveling. Garter stitch and honeycomb cables for the win! I ditched my cable needle for the small cables, so that they were really portable without needing a lot of notions bumping around in my project bag. For the first sample, I opted for a short row heel. I really like how they look and they are fun to knit! But....I began to worry about their stability. I asked my tech editor, Meaghan (who also happens to be a sock knitting guru!) what her favorite heels were for fit and stability. She turned me on to the Fleegle heel, and I cannot thank her enough!! To make today's pattern release even MORE exciting - I have completely revamped my pattern layout! This has been a huge undertaking that I couldn't have done without the help of 2 amazing women - Katie (who happens to be my sister ;) and Brittany of Kaba Creative. They are the geniuses behind my logo and now they have helped me take my patterns to the next level! I am learning In Design (whew!) and I really hope you love this new format. I would love to hear what you think about it in the comments below if you check it out on my new Tuku Honey pattern! When A Verb for Keeping Warm told me they were getting ready to launch a new marled version of their amazing Pioneer line, I couldn't wait to try it out! If you have never knit with Pioneer, I cannot recommend it enough! 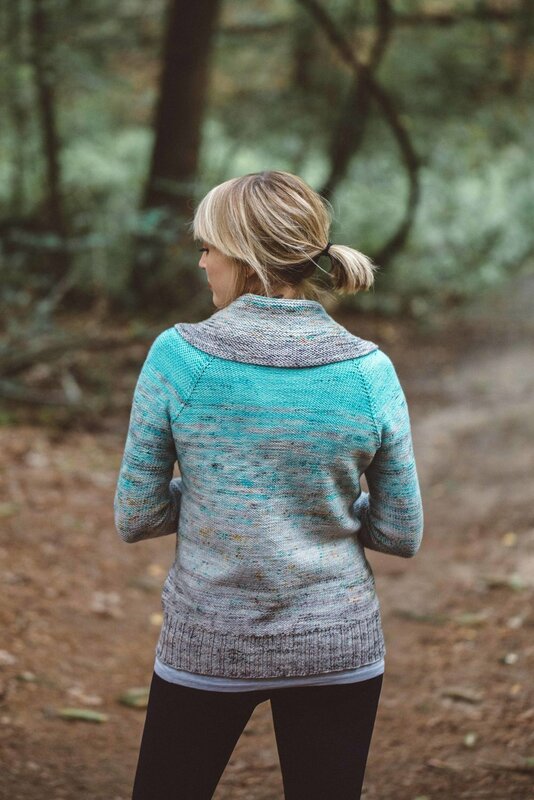 This 100% Organic California Merino is woolly, but not scratchy - think sturdy but cozy, and great stitch definition! It is one of my all time favorite organic yarns! I'd been dying to get some new slippers on my needles and was so excited to cast on! With holiday knitting upon us, I wanted a fun relaxing knit that would double as the perfect selfish or gift knit! The mukluks are offered in 3 adult sizes and can be adjusted to fit different foot lengths. The textured panel keep this knit engaging, without being too complicated. 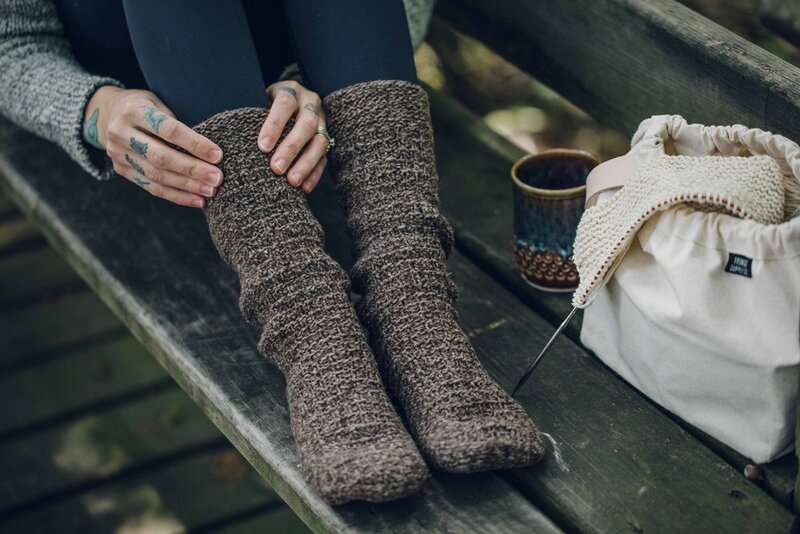 I hope you love these new Marluks (Marled + Mukluks ;) as much as I do! Please enjoy 15% off with the coupon code MARL until 10/4/17 at midnight EST! You can also purchase a ready to go kit from A Verb for Keeping Warm HERE! I also had a major "Aha!" moment with these slippers. I love an afterthought heel (as you may have guessed if you have knit any of my slipper patterns. An afterthought heel is awesome as it is pretty easy to execute, and if you ever wear out the heel, you can simply remove it and knit a new one! The trickiest part is probably the removal of waste yarn and slipping your stitches back on your needle. So while knitting these I realized I could place a lifeline in the rows of stitches on either side of my waste yarn, so that when my waste yarn is removed when I am ready to knit my heel, the stitches are safe and secure on my lifelines until I slip them back on to my needles! This also takes all the guess work out of if you are getting all of the necessary stitches back on your needles. I filmed a fun little video to show how I do this (below) and there is a handy link in the pattern as well! For more fun tutorials you can head over to my Youtube channel and subscribe! I've also just updated my Interviews page with some fun new podcasts and blog interviews! If you hoping to attend one of my workshops, you'll want to keep an eye on my events page! Some of you amazing and generous knitters have been asking if there is anyway you can give a little more to help with Michele’s medical costs. Seriously, you are all just beyond kind and generous! Michele’s sweet friend, Mara (many of you know her as Orangeknits) has set up a GoFundMe campaign! Here is a link if you are willing and able. No matter if you can give financially, or just by sending Michele all of your healing thoughts and love - it just means so much. Thank you!!! Adaptability. This word kept spinning around my head as this shawl grew on my needles. I wanted a shawl I could cast on with any weight of yarn, as many (or few) colors as inspired me, and I wanted to keep on knitting until I felt like stopping, no more and no less. I am so excited to say, that Free Your Fade checked off everything on my list - and more! 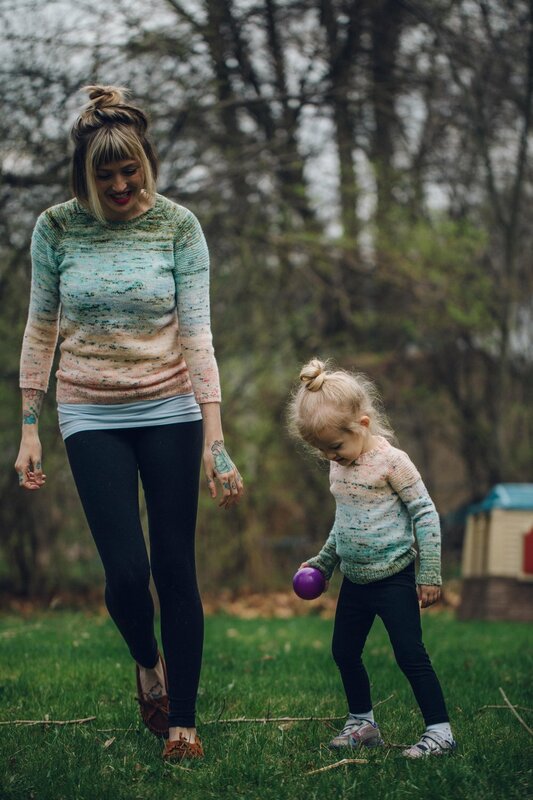 As a busy mama of two young children, I want my knits to be enjoyable, relaxing and just engaging enough to fill me up, but not wear me out! My dreams came to life for this new pattern as I grabbed 3 of my favorite skeins of Republic of Wool - Metal Heart, Ripple, and a Misfit skein that sweet Michele dyed up for me! Everything else just fell into place and I love that this gradient shows how you can really play with mashing up colors together in unexpected ways! I tweaked the faded sections in this shawl a bit to extend the melt, and I love how it turned out! 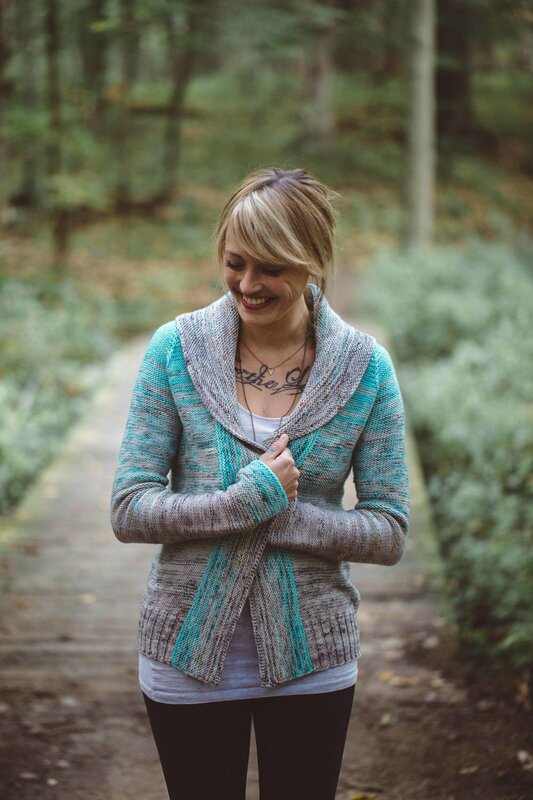 Free Your Fade mixes two of my favorite textures- garter stitch and eyelets. It is the perfect canvas for all of my color craving from speckles to solids! I've got plans for a one color summery version knit up in Brooklyn Tweed's new Vale yarn, and come this fall, you bet I'll be knitting up a super chunky one with Hedgehog Fibre's Chubby. I'm also dreaming about using different weights within one shawl (think skinny singles and fuzzy mohair ;) ! The possibilities are truly endless! As many of you know, I am a huge fan of Republic of Wool. I was thrilled when Michele participated in Yarn Babies last year and then when she agreed to help with my new fade - you better believe I was doing a happy dance! She has been such a big inspiration to me with the way she uses color. It has really motivated me to push past my comfort zone to start exploring more, and I am so happy I have! Sadly, Michele is going through a very scary time right now, as she has been having difficulty with her eyes. From what she knows at this point, her doctors think she has Secondary Angle Closure Glaucoma being caused by cysts within her eyes. Her doctors have never seen anything like this in someone so young, but they do know she will need to have an operation to prevent vision loss. Most likely then followed by some other laser procedures. As you can imagine, this is incredibly stressful for her. Michele has made our world so much brighter and more colorful with her gorgeous yarn, and I can think of no better way to thank her than to donate some of the proceeds of this shawl pattern to her surgery fund! I will be donating 15% off all Free Your Fade pattern sales through June 6, 2017. I hope we can all rally around her as she gets better. She has been so generous in dyeing up a few kits for Free Your Fade, all of which are unique. But please keep in mind, they will be very limited as she focuses on healing! stEEK-along! Let's take the EEK out of steeking!! Happy Monday! This week I am teaming up with two amazing designers - Shannon Cook of So Very Shannon and Caitlin Hunter of Boyland Knitworks - to challenge ourselves to explore Steeking with a little Instagram stEEk-along! Have you every steeked? Do you know what steeking is? Do you want to join us?! I've done my homework and sketched up a little color chart I plan to follow for my swatch. I am going to use Brooklyn Tweed's new DK yarn, Arbor, in Humpback and Thaw. I have been dying to get these colors on my needles together! From what I have read, it is best to use a stickier yarn - so non-superwash wool is ideal. I think Shelter or Loft would be even better! I think for the first time around, avoiding super slick superwash yarns seems to be a good idea. I am referencing this tutorial from Tin Can Knits, for when I am ready to do my cutting. There are lots of tutorials out there - so pick whichever speaks to you! So here are the details if you want to join in on the fun!! Beginning on Monday, April 3: Pick your yarn and start your swatch! Remember that you are knitting in the round ;) Not a fan of colorwork - no problem! You can swatch in one color, or choose stripes, or whatever fits your fancy! Make sure to post a picture of your yarn and scissors on Instagram and use the tag #stEEKal and #swatchnsteek, so we can all follow along and support each other! Monday, April 10: Snip day!! We will take the fear out of cutting into our knits and snip snip snip! Post a video or before and after pictures on Instagram with the tags #stEEKal and #snipyourknits! 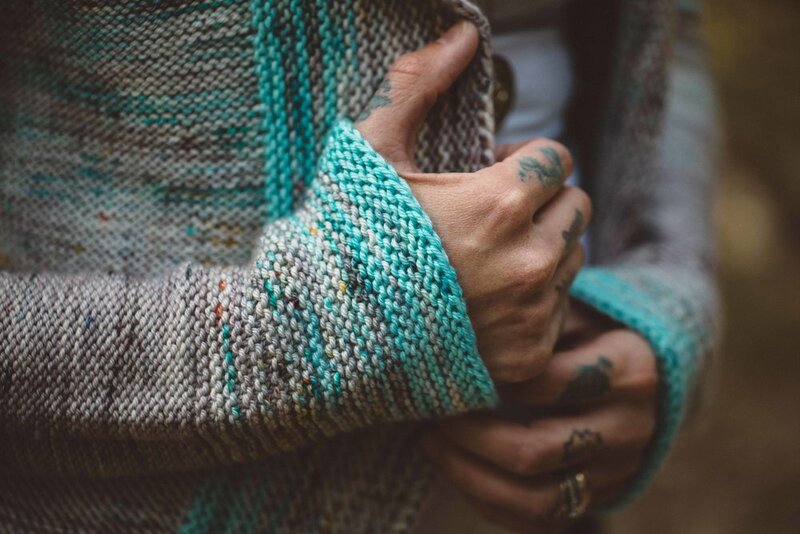 I am so excited to share my collaboration with Spincycle Yarns and Loop in London!! The Across the Pond cowl was released this past weekend at the Edinburgh Yarn Festival. I am thrilled to bring it to all of you today! As I began dreaming up a cowl design for Spincycle’s gorgeous yarn, I knew I wanted to create a mash up using two different techniques, and that at least one of the techniques involved colorwork. Spincycle’s Dyed in the Wool yarn takes colorwork to the next level with the way it melts from one tone to the next. I love it! A cowl is the perfect canvas for trying out some new techniques, and mosaic knitting is a favorite of mine! My love for knitting drew me to the graphic herringbone stitch pattern you see in “Across the Pond.” I love that it looks like big knit stitches! Mosaic knitting is also an awesome introduction to colorwork, as you are only ever dealing with one strand of yarn at a time. I also really love eyelets, and add them into patterns whenever I can! I found that the angles of the mosaic pattern balance out the round polka dots of the eyelets. Utilizing some different techniques and styles in this cowl also felt like a way to represent the colliding of two really awesome businesses - Spincycle Yarns & Loop London! The resulting cowl is so easy to wear. I love to thrown it on with jeans and a t-shirt, or dressed up with my favorite jacket. I hope you love it, too!! To celebrate Across the Pond's cyber release, please enjoy 15% off of your pattern purchase with the code POND until 3/15/2017 at midnight EST!